Sometimes irony is the product of complacency. So perhaps it isn’t surprising that political leaders using their secure Blackberrys in plans to battle ISIS are just two clicks away from a steady stream of ISIS propaganda, recruitment and radicalization efforts. For several months iBRABO has been screening Blackberry’s little known social media platform called “Channels”. Unlike many social media platforms the only way to access Blackberry Channels is to be a Blackberry messenger user as it is not available via the web. With over 1 million channels the private platform offers the ability for individuals and corporations to create channels on any topic with dynamic content directed at their audience. Unless you join a channel you have limited access to the content and the users interacting with the channel. In much the same way as is done on other platforms users can like and comment on the content being posted by the Channel provider. In examining Blackberry’s echo system we found over 6 channels (example above) specifically dedicated to providing ISIS content, some of which could be found with a simple search for the term “Islamic State”. In one particular post the group outlined the use of Blackberry Channels and several other platforms in its dissemination strategy. An analysis of the ISIS Channels revealed that several had been in operation since the start of 2015 coinciding with ISIS’s ongoing surge in social media implementation. Five of the sites linked to the ISIS media campaign on Blackberry targeted Indonesians specifically. Indonesia has recently heightened concerns around the groups attempts to get a foot hold there. The use of Blackberry devices in Indonesia is also very popular thus explaining why ISIS was using the platform to gain influence with users. Three of the sites directly linked to ISIS WordPress sites including Daulah Islam Baqiyyah (below), Daulah Khilafah Islamiyah, and Daulah Islam Baqiyyah (caution graphic content). WordPress too has been a favorite of ISIS in developing its online presence and has repeatedly been used by the group in multiple languages. 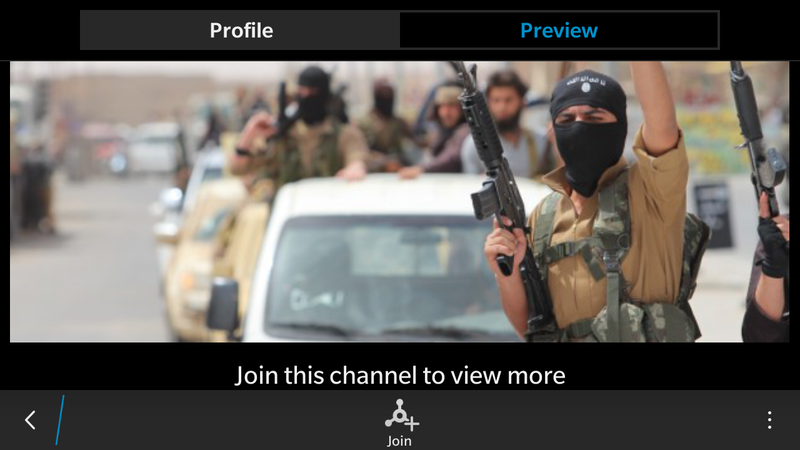 The Al-Hayat Media wing of ISIS was also found to be on Blackberry Channels. Al-Hayat has been cited as being a steady source of ISIS propaganda over the last year and a half and is the publisher of the infamous Dabiq magazine covering all aspects of the Islamic State’s rise to power. As with the channels highlighted above the Al-Hayat Channel was specifically targeting an Indonesian audience with their content (see below). That ISIS found a way to utilize Blackberry Channels is really not surprising given their reputation as early adopters of social media and technology. Virtually every platform that has been explored by the group in one way or another. The days of creating a social media platform and not allocating resources towards terrorism prevention/disruption have long past us. Blackberry is not the first or the last company to experience this and in fact a long list of social media companies have been taken to task in their efforts (or lack thereof) against terror networks. In this regard there have been mixed results in their attempts to stem the tide of terrorist content. Less than a week after iBRABO notified Blackberry of ISIS channels on their network (and they removed the Islamic State site above), ISIS affiliates recreated three new channels to resume operations. The debate around continually tearing down terrorist content essentially has two main opposing sides. On one side are the advocates that claim vulnerable individuals to recruitment will be negatively influenced by the propaganda and recruiting message of groups like ISIS. It is a scorched earth approach trying to eliminate every trace of violent extremist ideological from the internet. This approach has essentially received mixed results for many reasons not withstanding the immense media attention that terrorist groups like ISIS attract by their deeds. There are indications however that the progress of ISIS has been slowed and redirected by mass suspensions as in the case of Twitter according to J.M. Berger. The opposing side would argue that social networks allow an immense opportunity for BOTH intelligence gathering and prevention / interdiction applications. However the social media companies themselves are reluctant to take an offensive posture in this regard. They also do not want to appear to be handing over the private data of their customers for fear of hurting their bottom line. Much like the war on terror the war on terrorist social media shows no clear evidence of slowing terrorist group efforts. We are losing, we are two steps behind, and absent of a clear strategy and new approach we will continue to be shocked by the progress that ISIS continues to make. Enter a new breed of academics, analysts, companies and tools that have become comfortable working in the grey area of terrorist social networks. By its sheer nature the “social” aspect of social media means that individuals are giving away information about themselves that can be collected and analyzed through open source intelligence techniques. Even in a secure social network such as Blackberry’s Channels, individuals using their personal phones, images and in some cases real names provides us with valuable information. It is the use of this information that has allowed for a new approach to examining terrorist social networks. An approach that focuses on exploring both prevention and interdiction with individuals. An approach that recognizes that the community will have the largest role in targeting both the extremist message and intervening with individuals at risk. It is time to rethink our next move with respect terror social networks, as there is little doubt ISIS has already planned theirs. Dr Camie Condon is a post-doctoral researcher with the Tactical Decision Making Research Group at the University of Liverpool. She is also an Analyst with the Intelligence Research Group iBRABO. Jeff Weyers is a Senior Analyst with the Intelligence Research Group iBRABO and is a Doctoral researcher with the Tactical Decision Making Research Group.